This topic describes the tools you use to build an Open edX course, and how to create your first course. If you are creating a course to run on edx.org or edX Edge, see Getting Started with Studio in the Building and Running an edX Course guide. Studio is the edX tool you use to build your courses. When you log in to Studio, you see the following page, which is your My Courses dashboard. Select Create Your First Course. 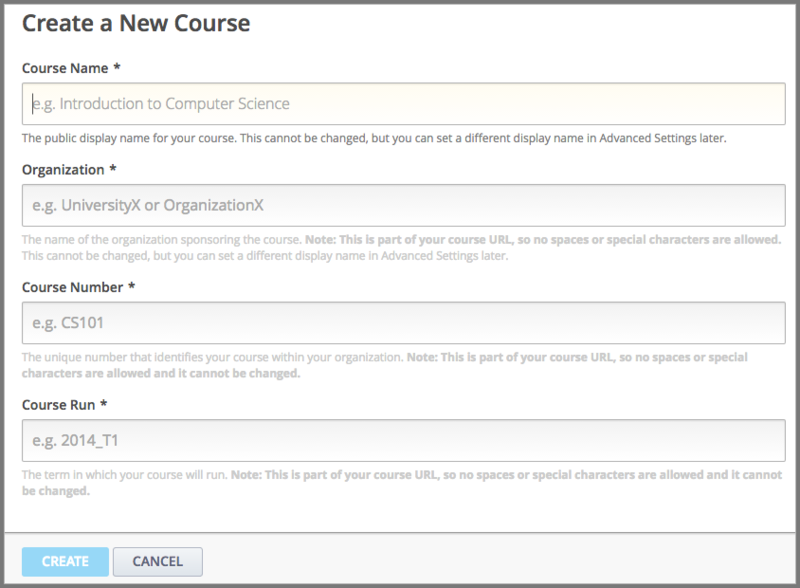 Enter course information as needed, and then select Create. Enter new course information carefully. This information becomes part of the URL for your course. Because this information becomes part of your course URL, the total number of characters in the following three fields must be 65 or fewer. For Course Name, enter the title of your course. For example, the name may be “Sets, Maps and Symmetry Groups”. Use title capitalization for the course title. For Organization, enter the name of your institution. Do not include whitespace or special characters. For Course Number, enter both a subject abbreviation and a number. For example, for public health course number 207, enter PH207. For math course 101x, enter Math101x. Do not include whitespace or special characters in the course number. Your new course opens to the Course Outline page. Because no content has been added, this page is empty. In your browser’s address bar, notice that the URL of your course includes the course organization, number, and course run. The other sections of this guide describe how you now build and run your course.